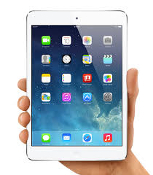 Buy any (5) CampusMortgage "professional development" online training classes, and get an Apple iPad Mini (16 GB) at NO extra charge*. Take advantage of this special promotion, and start learning the mortgage process, from start to finish. LAPP/SARR Underwriter - "Step by Step Instruction"
*Note: Subject to conditions and exclusions. Not applicable to prior orders. We reserve the right to change curriculum and/or discontinue (at any time) any our classes listed above. Aspiring mortgage processors, loan officers, closers, post-closers & underwriters wishing to learn various aspects of the mortgage process. Whether you're unemployed and looking to enter the mortgage profession, or you're currently working at a bank or lender as an loan processor or underwriter, our training classes will help provide the skills you need to succeed as an effective mortgage underwriter, processor, closer, post-closer and more. No refunds or credits will be issued if a student and/or customer has logged into any online webinar course or has requested a Certificate of Completion for the course/certification/bootcamp/bundled package purchased. If a student and/or customer has not logged into an online webinar course or has not requested a Certificate of Completion, the customer is entitled to a full refund (minus a $75 administrative cancellation fee) provided a refund request is received in writing or via e-mail by CampusMortgage® within (5) calendar days from the date of purchase. All CampusMortgage® online training classes are "professional development" and are for informational purposes only (not licensing training). Obtaining a CampusMortgage® Certificate of Completion does not imply you are an "expert" or "licensed" in any mortgage related field -- it simply means you've taken (X) hours of online training. We do not guarantee you will find a job. We do not provide job placement assistance. We are not owned, operated or affiliated with HUD, FHA or the Federal Government in any way.